Hypnos, the award winning makers of hand crafted beds, have been making bespoke, made to measure beds since Edwardian days. These luxury mattresses and designer beds can be found in the finest homes, yachts, palaces and hotels. 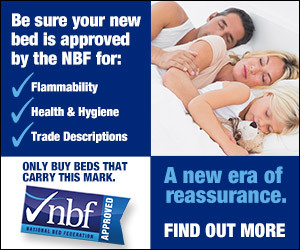 With over 100 years of bed making experience, Hypnos? philosophy focuses on the pursuit of perfection and the delivery of a deep, energising night?s sleep, helping to fulfil dreams for a healthy life. Hypnos wool pillowThis Hypnos wool pillow can be adjusted and plumped time and time again, inside th..
High Profile Latex PillowWake up each morning with the feeling of being completely rejuvenated and r..
Low Profile Latex PillowWake up each morning with the feeling of being completely rejuvenated and re..
Hypnos Pocket Spring PillowThis is the Pocket Spring pillow with over 40 individual pocket springs t..
Hypnos Wool Filled Mattress TopperWool Filled Topper - The layers of luscious British wool and the s..
Beech SupremeThis luxury mattress features a 3-zone ReActive™ pocket spring system. Each ReActive™ s..
Cherry SublimeThis luxury seasonal turn mattress features a 3-zone UltraSens™ pocket spring system. .. The Clarence SupremeThe Clarence Supreme from Hypnos is the top model in the new Regency supreme ran..
Cypress DeluxeThis luxury mattress features a 3-zone ReActive™ pocket spring system. Each ReActive™ ..
Every spring in this luxury mattress has 9 active turns – each spring independently senses your shap.. This supportive mattress features a ReActive™ 9-turn pocket spring system. Each spring independently..
Every spring in this luxury mattress has 8 active turns – each spring independently senses your shap.. The Hypnos Pillow top Beach is the starting model in the new Hypnos pillow top bed range and offers .. The Hypnos Pillow topBeach is the starting model in the new Hypnos pillow top bed range and offers g.. The Pillow top Larch divan bed offers a similar specification to the Emerald in that they both have .. The Hypnos Pillow Top Maple bed is part of the Hypnos Pillow Top collection of divan set also featur.. The Oak is a new Pillow top divan bed that has replaced the pillow top elite from the old range. The..
Rowan SuperbThis luxury mattress features a 3-zone UltraSens™ pocket spring system. Each UltraSens™ ..
Hypnos Trio Guest BedThis three-in-one, elegantly upholstered guest bed offers the ultimate sleeping..
Hypnos Eleanor HeadboardThis headboard is the Euro Slim type, meaning it is floor standing and is fl..
Hypnos Eleanor HeadboardThis Hypnos headboard is a floor standing, wider than your base which frames..
Hypnos Eleanor HeadboardThis Hypnos headboard is strutted, you can adjust the height of it. The widt..
Hypnos Elizabeth HeadboardRecognising that everyone has personal design and style preferences, the H..
Hypnos Emily HeadboardThis headboard is the Euro Slim type, meaning it is floor standing and is flus..
Hypnos Emily HeadboardThis Hypnos headboard is a floor standing, wider than your base which frames y..
Hypnos Emily HeadboardThis Hypnos headboard is strutted, you can adjust the height of it. The width ..
Hypnos Fiona HeadboardThis headboard is the Euro Slim type, meaning it is floor standing and is flus..
Hypnos Fiona HeadboardThis Hypnos headboard is a floor standing, wider than your base which frames y..
Hypnos Fiona HeadboardThis Hypnos headboard is strutted, you can adjust the height of it. The width ..
Hypnos Grace HeadboardThis headboard is the Euro Slim type, meaning it is floor standing and is flus..
Hypnos Grace HeadboardThis Hypnos headboard is a floor standing, wider than your base which frames y..
Hypnos Grace HeadboardThis Hypnos headboard is strutted, you can adjust the height of it. The width ..
Isobella HeadboardThis headboard is the Euro Slim type, meaning it is floor standing and is flush wi..
Isobella HeadboardThis Hypnos headboard is a floor standing, wider than your base which frames your ..
Isobella HeadboardThis Hypnos headboard is strutted, you can adjust the height of it. The width is t..
Josephine HeadboardThis headboard is the Euro Slim type, meaning it is floor standing and is flush w..
Josephine HeadboardThis Hypnos headboard is a floor standing, wider than your base which frames your..
Josephine HeadboardThis Hypnos headboard is strutted, you can adjust the height of it. The width is ..
Hypnos Katherine HeadboardThis headboard is a floor standing, wider than your base which frames your..
Hypnos Petra HeadboardThis headboard is the Euro Slim type, meaning it is floor standing and is flus..
Hypnos Petra HeadboardThis Hypnos headboard is a floor standing, wider than your base which frames y..
Hypnos Petra HeadboardThis Hypnos headboard is strutted, you can adjust the height of it. The width ..
Hypnos Victoria HeadboardThis headboard is the Euro Slim type, meaning it is floor standing and is f..
Hypnos Vienna HeadboardThis Hypnos headboard is a floor standing, wider than your base which frames .. The Hypnos Pillow Top Larch mattress is part of the pillow top mattress collection from Hypnos. The .. The Maple is the new top mattress in the Hypnos pillow top range and has replaced the pillow top sub.. The Oak is another new pillow top mattress from Hypnos that has replaced the pillow top elite from t..